Since the advent of photography, the love affair with capturing images of Venice has never waned. Today it is still one of the most photographed places on earth in great part because it has retained its unique timeless character that once seen, begs to be shared. And that is the purpose of this book, a distillation of more than 20,000 photographs taken over the course of a decade by award winning photographer Scott Marx. The images were selected to convey more than just a visual representation, they are also meant to elicit emotion and trigger other sensations present when they were captured. Hearing the waters lapping in the canals and boat hulls, feeling the grit between the paving stones and bricks, smelling the salt air on the wind as it blows across the lagoon. They are meant to evoke a sense of wonder at the scale of the ornate palaces, the peacefulness of a placid canal, and allow the viewer to be instantly transported through the centuries simply by turning the page. 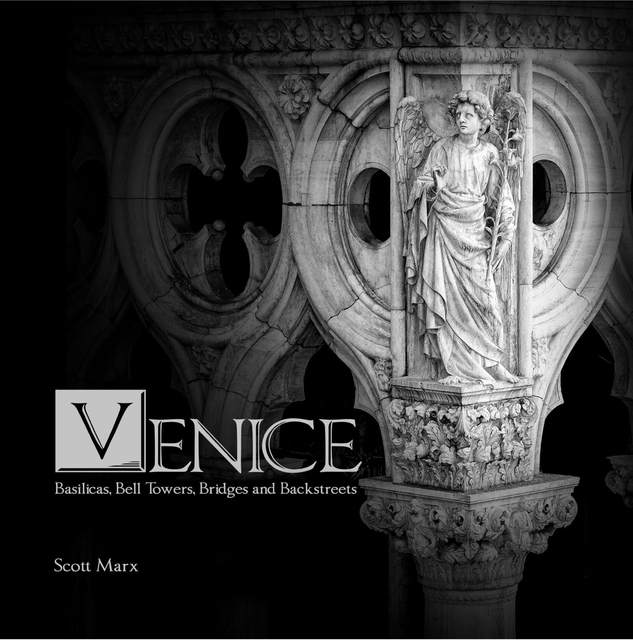 The imagery been processed for high contrast with deep blacks and rich textures reminiscent of the character seen in those first photographs of Venice taken almost two hundred years ago. While many of the subjects in these photographs have been captured thousands of times before, it is hoped that these images will offer an interpretation that is new and distinct in character and that they will add, even in a small way, to the rich visual history of La Serenissima. Versión ebook de composición fija, 114 págs.